Most of the ocean floor is unknown. Gravity models generated from radar altimetry from satellites provide one of the only ways to map the height of the seafloor beneath all of the oceans. Years of data and thousands of satellite tracks have yielded unprecedented detail of major spreading ridges and thousands of seamounts. Mapping these and other tectonic features will help to better understand Earth processes and how the land and ocean floor are connected. About 80 percent of the seafloor is unknown because it is uncharted or buried beneath thick sediment. Satellite-based radar altimetry from the European Space Agency’s CyroSat-2 and NASA/Centre National d’Etudes Spatiales’ Jason-1 now provide enough accuracy to map sediment-covered topography. The higher accuracy comes from 1.25 times improvement in range precision, dense track spacing from over 70 months of observations, and more diverse track orientations. Modeling the global marine gravity with a factor of 2 to 4 improvement in the data, allows resolution of structures as small as 6 kilometers. Early analysis of the new map reveals old spreading ridges in the Gulf of Mexico and the South Atlantic Ocean. Each ancient fracture is a region where the ocean floor was spreading apart, millions of years ago and the new detail will help to understand changes in crustal plates that happened long ago. In addition, the region in the South Atlantic is of interest for oil and gas exploration. The new maps also refine the height of features on the seafloor, particularly those of thousands of seamounts. 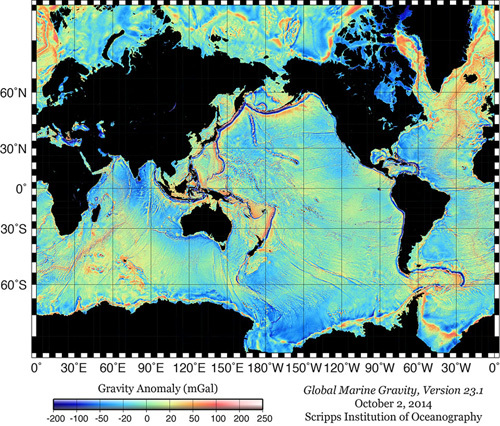 The enhanced global marine gravity model allows geoscientists to resolve fracture zones, seamounts and continental to oceanic boundaries. These features are clues to tectonic processes, plate motions and how dynamic processes are connected between the land and the sea. The seafloor structures inform our understanding of faults, earthquakes, tsunamis, volcanic eruptions and many other processes that have research and societal implications. The new map also informs marine navigation and marine exploration and development. David T. Sandwell et al., New global marine gravity model from CryoSat-2 and Jason-1 reveals buried tectonic structure, Science 346, 65 (2014); doi:10.1126/science.1258213. 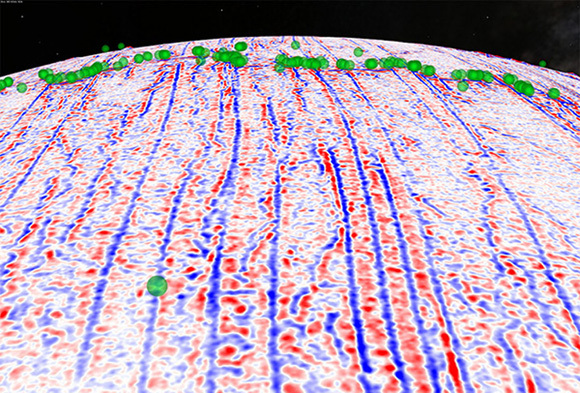 Perspective: Geophysics Seafloor secrets revealed, Cheinway Hwang and Emmy T. Y. Chang, Science, 3 October 2014, pp. 32-33 doi:10.1126/science.1260459.